Use the Search Box below to select the ZIP Code or Star Rating you are interested in. 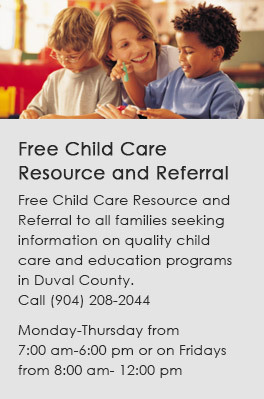 CLICK HERE to download a list of all Guiding Stars of Duval participating child care centers and family child care homes. Guiding Stars of Duval allows families to have more information to better choose a quality child care setting for their child. You can use the Star Rating to make the an informed choice of what matters most to you when choosing quality child care. Centers participate on a voluntary basis and are assessed objectively every two years to determine their Star Rating.